By Rob Booz of Chefs Collaborative. Crossposted from Tech Connect. As the chefs in the Chefs Collaborative network constantly remind us, the first step to being a sustainable restaurant is being a profitable restaurant. If you can’t stay open, what’s the point? So for chefs out there looking to make more sustainable choices, it’s critical that they can also maximize their resources and do more than stay afloat. We at Chefs Collaborative are noticing that chefs are increasingly using mobile technologies and apps to manage their time and resources more effectively. Where does this come into the discussion of “hacking” meat? 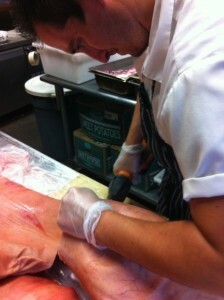 All over the country, and in increasing numbers, chefs are turning to whole animal butchery as a source of sustainable meat.While chefs tend to enjoy both the challenge of using whole animals and the high level of quality associated with working with farm-direct animals, the use of whole animals creates its own set of challenges. Any chef using whole animals will tell you this commitment takes more time, more highly skilled labor and more oversight. If you can’t find ways to save on time and labor costs, then the nominally lower prices you pay for a whole animal are all for naught. Therefore, making the choice to perform whole animal butchery demands a high level of efficiency both in processing and inventory control to stay profitable. Technology really provides an opportunity for more and more chefs to streamline their kitchens and improve their profit margins to let sustainability in. In a professional kitchen, multitasking is a must. Thanks to the high portability of tablets and smart phones, chefs can optimize their ability to edit menus and control inventory in real-time from the line, monitor many stations in the kitchen from one easy to read screen, and the possibilities go on and on. All of this in an easily located and constantly updated format that is scalable to even the largest of commercial kitchens. How does your restaurant use technology? Share your thoughts in the comments below, on Twitter using #hackmeat, or on Facebook. Hacking Meat is an online conversation exploring how can information and technology be used to hack (or reimagine) a more sustainable, profitable and healthy future of meat. Join the conversation and share your ideas or product requests in the comments, on Twitter using #hackmeat, and on Facebook.